With Will and Elizabeth Turner happily married and Captain Jack currently seeking out stranger tides, a spot has opened up in the summer blockbuster schedule for another Jerry Bruckheimer piece of pure popcorn entertainment. In steps “Prince of Persia,” a film (and Bruckheimer hopes a franchise) based upon Jordan Mechner’s cult videogame classic. 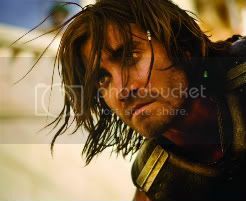 Dastan (Jake Gyllenhaal) is a street urchin in sixth-century Persia. After showing valor in battle, he is adopted by the king as his heir, so the king’s two sons will not fight over the throne. He teams up with Princess Tamina (Gemma Arterton) to rescue the Sands of Time, a gift from the gods that controls time, from the hands of the villainous nobleman, Nizam (Sir Ben Kingsley). A slew of eye-popping featurettes have been released covering everything from the parkour-inspired stunts to the backstory of Dastan (and how, inexplicably, he has a better English accent than Gemma Arterton!) to the “big bads” of the film the Hassansins. One word of warning however, don’t watch them all in a row, otherwise you may notice that they are all mostly made up of the same footage with very little variation in the information actually offered. But to be fair, what footage it is! The effects of the Sands of Time on Prince Dastan are particularly spectacular and that’s just based on the quick shots they show us here. The previously-mentioned parkour action pieces seem inspired also, even bringing into the production free-running legend David Belle to train the cast. I do not want to jinx this film, but at the moment it appears to possibly be the one videogame-inspired film that could turn out to be a bonafide genuine hit. Bruckheimer seems to have the Midas touch and it looks like his with Jake Gyllenhaal’s buffed up Persian, he is about to strike gold again. “Prince of Persia: The Sands of Time” is due for release of May 28.